, an English prelate, was born about 1706, at Beverly, in Yorkshire, and received the rudiments of his education at a private school. 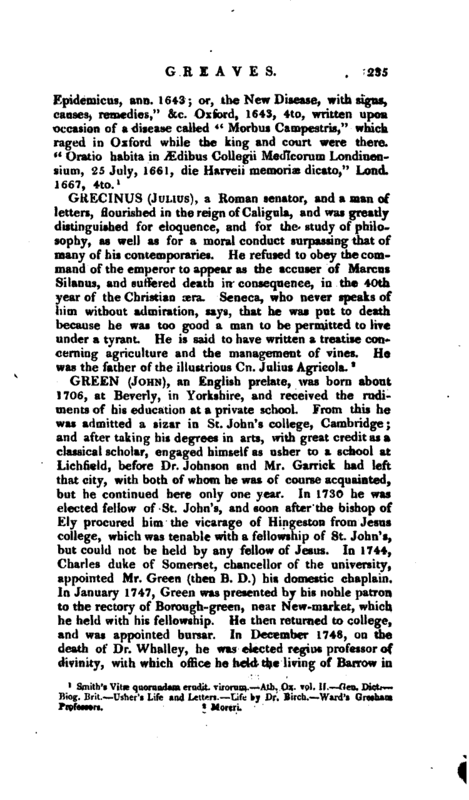 From this he was admitted a sizar in St. John’s college, Cambridge; and after taking his degrees in arts, with great credit as a classical scholar, engaged himself as usher to a school at Lichfield, before Dr. Johnson and Mr. Garrick had left that city, with both of whom he was of course acquainted, but he continued here only one year. In 1730 he was elected fellow of St. John’s, and soon after the bishop of Ely procured him the vicarage of Hingeston from Jesus college, which was tenable with a fellowship of St. John’s, but could not be held by any fellow of Jesus. 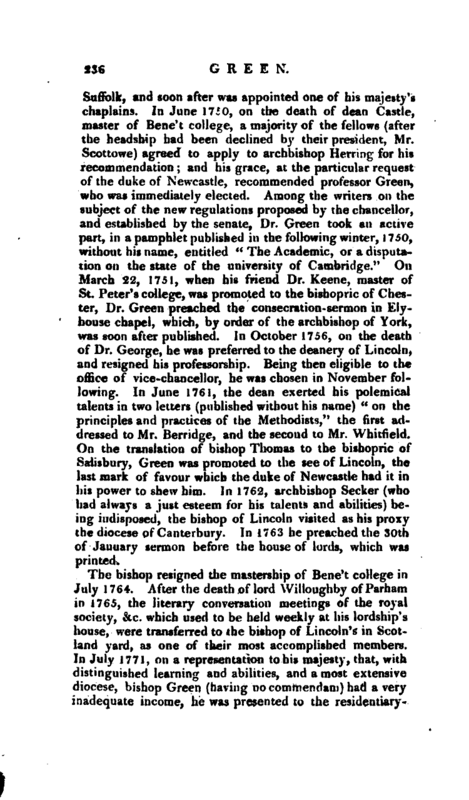 In 1744, Charles duke of Somerset, chancellor of the university, appointed Mr. Green (then B. D.) his domestic chaplain. In January 1747, Green was presented by his noble patron to the rectory of Borough-green, near New-market, which he held with his fellowship. He then returned to college, and was appointed bursar. In December 1748, on the death of Dr. Whalley, he was elected regius professor of divinity, with which office he held the living of Barrow in | Suffolk, and sodn after was appointed one of his majesty’s chaplains. In June 170, on the death of dean Castle, master of Bene’t college, a majority of the fellows (after the headship had been declined by their president, Mr. Scottowe) agreed to apply to archbishop Herring for his recommendation; and his grace, at the particular request of the duke of Newcastle, recommended professor Green, who was immediately elected. Among the writers on the subject of the new regulations proposed by the chancellor, and established by the senate, Dr. Green took an active part, in a pamphlet published in the following winter, 1750, without his name, entitled “The Academic, or a disputation on the state of the university of Cambridge.” On March 22, 1751, whenhis friend Dr. Keene, master of St. Peter’s college, was promoted to the bishopric of Chester, Dr. Green preached the consecration -sermon in Elyhouse chapel, which, by order of the archbishop of York, was soon after published. 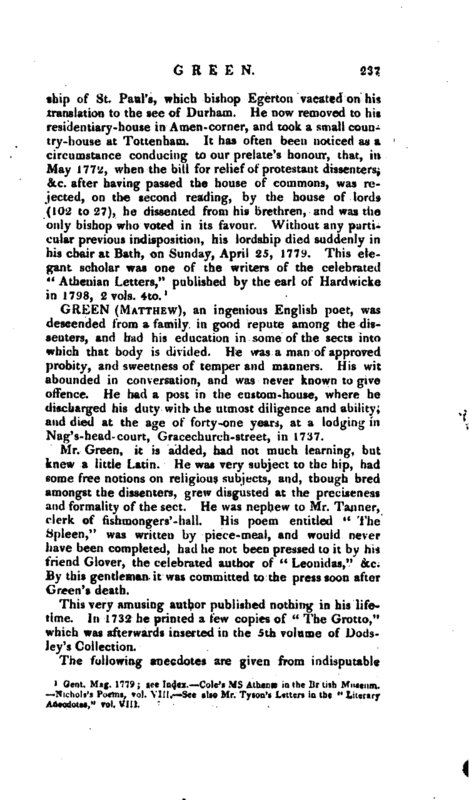 In October 1756, on the death of Dr. George, he was preferred to the deanery of Lincoln, and resigned his professorship. Being then eligible to the office of vice-chancellor, he was chosen in November following. In June 1761, the dean exerted his polemical talents in two letters (published without his name) “on the principles and practices of the Methodists,” the first addressed to Mr. Berridge, and the second to Mr. Whitfield. On the translation of bishop Thomas to the bishopric of Salisbury, Green was promoted to the see of Lincoln, the last mark of favour which the duke of Newcastle had it in his power to shew him. In 1762, archbishop Seeker (who had always a just esteem for his talents and abilities) being indisposed, the bishop of Lincoln visited as his proxy the diocese of Canterbury. In 1763 he preached the 30th of January sermon before the house of lords, which was printed. Gent. Mag. 1779; see Index. 'Cole’s ms Athenae in the British Museum. Nichols’s Poems, vol. Viu. See also Mr, Tyson’s L-tters in the “Literary Anecdotes,” vol. VIII.